When making the move to play pokies online, you’ll start seeing many games promoted as “243 way” games. Don’t be put off if you’re completely unfamiliar with the term; this article will explain exactly what a 243 way pokies game is, how to play them and some of the most popular 243 way titles. What are 243 ways to win pokies? When a pokie is called a “243 way” game it is referring to the amount of possible winning combinations within that game. Unlike the classic three reel slot machines where wins were typically formed over a set paylines, 243 ways games means predetermined paylines are no longer relevant. 243 ways games use a five reel format where winning combinations can be formed anywhere across the reels, from left to right, regardless of the height that the symbol appears. 243 way pokies games have become amongst the most popular type of slot offered online and you’ll commonly find this game format offered at our recommended casinos. If you’re familiar with the five reel pokies format, playing 243 way pokies will be a breeze. All you need to do is head to one of our recommended safe casinos, select the 243 way game of your choice and place your bet. Use the bet buttons to increase the coin value you wish to wager along with your desired bet level, hit spin and you’re on your way to a potential win. The cost of each game will vary, with different minimum and maximum bets applying to each game. 243 way pokies can generally cost anywhere from a couple of cents to hundreds of dollars per spin depending on the game specifications and the options you’ve selected. 243 way pokies come with features like the wild symbol and the scatter symbol, which are unique to each game. These symbols really add to the excitement levels and can dramatically increase your chances to win. Wild symbols – these symbols are used to substitute for any other symbol in order to create a winning combination, which in a 243 way game means a wild can complete a variety of wins. Scatter symbols – the appearance of a scatter symbol can be incredibly lucrative as it’s these symbols that are usually responsible for triggering a games bonus rounds or activating free spins. 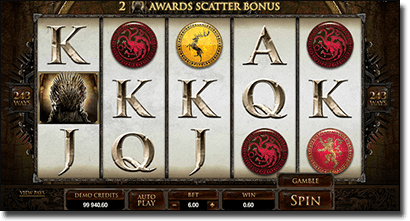 Game of Thrones – based on the hit HBO series, this Microgaming slot has two versions, the 243 way game and the 15 payline game, with our preference strongly towards the 243 ways version. While you won’t find any of your beloved GOT characters here, the game definitely captures the vibe of the Seven Kingdoms of Westeros and is a favourite for fans of the show. 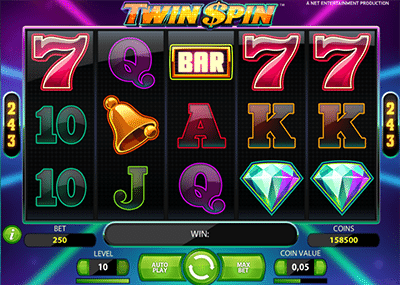 Twin Spin – this vibrant NetEnt game uses the Vegas disco era as its theme, making for a lively gaming experience with 243 ways to win. Simple yet effective graphic coupled with a jiving disco soundtrack make Twin Spin a great choice when you need a little lift to your day. Immortal Romance – if you love the Twilight series, you can’t go past Immortal Romance. While not affiliated with the Stephanie Meyer creation in any way, this game is loosely based on the Edward/Bella saga but cleverly disguised using different names. This is vampire romance meets big bucks, presented in an exciting 243 ways format. The Dark Knight – based on the blockbuster movie starring Christian Bale and the late Heath Ledger, not only is The Dark Knight pokies a 243 ways game, but it’s also a progressive jackpot game, making this one a huge drawcard with a base jackpot of $1,000,000. Jurassic Park – another movie themed game, the Jurassic Park pokies uses footage and stills pulled directly from the iconic Steven Spielberg film from the 90’s. Along with 243 ways to win, there are some awesome bonus features in this game including the T-Rex Alert Mode and some mega free spins. The simplest reason to choose a 243 way game over a classic slot machine is that they offer many more ways to win. With more winning combinations, it’s likely that you’ll never go more than a handful of spins without landing on some form of a win. In addition to this, 243 way games have brought huge advances to the graphic ability of online pokies, making them much more visually advanced than the classic fruit machine type pokies. Given the hundreds of different winning combinations, 243 way games also come with some fantastic bonus games, making for fun and entertaining game play. Given the huge popularity of 243 way games, you’ll find a solid selection of 243 ways pokies at each of our endorsed casinos. If you’re looking for a secure venue that accepts deposits in Australian currency, follow our links in the casino table above to visit the leading online casinos accepting players from your country and take advantage of some great welcome offers. You can try 243 way slots at these sites for free play before committing to making any real money wagers, so head on over and give the 243 ways format a go today. For more great online slot games, check out our online slots review page. We recommend Bovada Casino as our top-rated casino site for players from United States, which has some excellent welcome bonuses available for new players along with a great range of slot games to choose from.